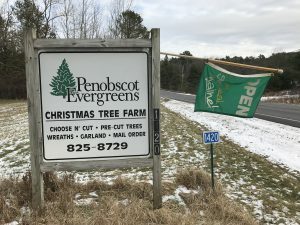 Choose ‘n Cut your tree on the banks of the scenic Penobscot River. We have some pre-cut trees available too. 22” and 32” Wreaths available. We provide bow saw for cutting, sleds to help haul the tree, and netting for free. Free hot cocoa in the sales shed. Cash or checks. Balsam Fir – $40 = 8′ and under; $55= 9′ + 10’; $75=11’ and greater. Concolor/white Fir are+ $5 extra.